The extremely weak non-manufacturing data caused stocks to tumble when traders priced in a greater likelihood of a domestic recession on the day millions of Americans went to the polls to vote in electoral primaries. At mid-afternoon the S&P 500 was down 2.6 percent at 1,345.25. 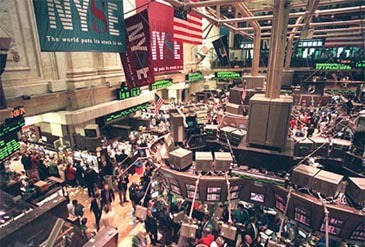 The Nasdaq Composite fell 2.4 percent to 2,326.46 while the Dow Jones Industrial Average shed 2.4 percent to 12,334.06. The equities sell-off was accompanied by an increase in the CBOE Vix index - Wall Street's "fear gauge" - which jumped 8.3 percent to 28.14. The ISM non-manufacturing index recorded its biggest fall in its history, plunging to 41.9 last month from a reading of 54.4 in December. It was the first contraction in service sector business activity since the start of the Iraq war and the lowest reading since October 2001. Economists were ex-pecting only a small pullback to 53.5, where a reading above 50 indicates expansion. "This data release corroborates the notion that the US economy is in recession,"T.J. Marta, fixed income strategist at RBC Capital Markets, said. Other analysts were more sanguine, noting that such a dire reading could be a contrarian indicator and investors should therefore buy into market weakness. Bond prices rose sharply and the yield curve steepened as traders speculated that the Federal Reserve would keep slashing interest rates to head off a severe economic downturn. The futures market priced in a 98 percent likelihood of a 50 basis point easing when the Fed meets in March, with at least two 25bp cuts regarded as likely by June. Financial stocks led the sell-off after Fitch Ratings said it might downgrade some of the safest triple-A rated collateralised debt obligations by as much as five notches. Among the biggest fallers were Citigroup, down 6.3 percent at $27.38 and Bear Stearns, 5.2 percent lower at $86.24. Also retreating sharply was Goldman Sachs, down 4.7 percent to $191.30, after Oppenheimer & Co analyst Meredith Whitney cut her rating from "outperform" to "perform" citing valuation concerns. Ms Whitney said Goldman would "suffer from its own success" as it faced tough earnings comparisons this year. Homebuilder stocks initially rallied after Banc of America Securities raised its rating on four companies, citing expectations that lower house prices would increase demand. That mood had dissipated by mid-afternoon, with the S&P homebuilder index down 1.5 percent. Analyst Michael Wood told investors to buy shares in KB Home, Pulte Homes and MDC Holdings and set a neutral rating on Toll Brothers, predicting an average share price rise of 20 percent in the coming year. KB Home fared best, rising 1.3 percent to $26.49. Homebuilders were one of the worst performing sectors last year when house prices plummeted and builders posted massive losses. But together with fellow laggards such as financials, transports and retailers, they have rallied as traders have favoured value stocks - shares considered cheap relative to their fundamentals - over growth stocks - companies whose earnings are expected to grow rapidly. "Although we expect the growth trade to resume, we do believe there is more to recent value outperformance than short covering," Lori Calvasina, small-mid cap strategist at Citi Investment Research, said. After hitting a low on January 9, the S&P homebuilder sector index soared more than 50 percent, though it remains more than 60 percent below its 2005 high. Earnings news was led by News Corp, up 1.7 percent at $20.29, which increased fourth-quarter profit 1.2 percent to $832m. Whirlpool soared 12.6 percent to $91.83 after the appliance maker increased quarterly earnings by 72 percent.